That’s what an underworld figure growls to the bounty hunter in the new Star Wars series The Mandalorian, but it also applies perfectly to a similar masked figure who shocked this year’s galactic fan gathering in Chicago. That would be a 1979 Boba Fett toy — one of three extremely rare ones, with a firing rocket pack — selling on the Star Wars Celebration show floor for $365,000. He spoke to EW while standing in front of the glass case displaying the figure at his booth, surrounded by other toy and T-shirt vendors in the vast showroom. Inside the case, the Fett figure was contained in an even smaller glass box, slowly revolving on a mirrored stand with papers documenting its provenance and history displayed behind it. This action figure is considered precious because it’s one of only three of its type known to exist. But also… it represents the fulfillment of a broken promise. “You never got it, so of course you want what you can’t have,” Rachfal said. A full year before anyone saw Boba Fett hunt down Han Solo in 1980’s The Empire Strikes Back, the toymaker Kenner began hyping the action figure with illustrations of it firing a spring-loaded red missile out of its rocket pack. Whoever this Boba Fett guy might be, fans already considered him the coolest toy in the universe. Then at the last minute, Kenner feared the rocket mechanism posed too much of a choking and eye-gouging hazard. The company decided against mass producing that toy, making the rocket pack solid instead. Star Wars collectors received only disappointment in the mail — and for many fans that feeling remains in mint condition four decades later. Rachfal was one of those kids himself. “I was depressed for several months, and I just talked to a couple guys here that have gone through the same thing,” he said. 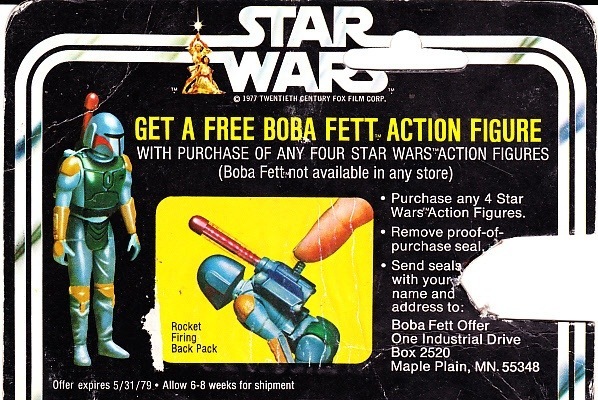 Only a tiny number of prototypes and display versions of the rocket-launching Fett were created back in 1979, perhaps as few as 100, and of those less than about 30 are known to still exist, according to the official Boba Fett Fan Club. The particular Fett that Rachfal is selling is even more obscure, mainly because the other versions don’t have a copyright embossed on the back of the leg, like his does. That signifies that it was close to the final sculpt ready for production. It also has the rarer “L-shaped” firing mechanism. (The others have a J-shape.) And its rocket has four sides instead of the more common eight. Still, the question stands: Is this plastic figure actually worth $365,000? For perspective, Entertainment Weekly got in touch with Steve Sansweet, who for 15 years, until retiring in 2011, was Lucasfilm’s fan ambassador and director of content management. Now he runs Rancho Obi-Wan, a museum in Petaluma, Calif., which is the world’s single largest collection of Star Wars memorabilia. One such “Rocket Fett” went up for auction at Hake’s last March for an estimated $35,000 to $50,000. After 26 bids, it sold for $86,383.47. However, it doesn’t have the copyright stamp on the back leg, as Rachfal’s does. “If it were up at auction, do I think it would go that high? I would tend to doubt it,” Sansweet said. In his Rancho Obi-Wan collection, Sansweet also possesses one of these three known Rocket Fetts. Earlier this year, Rachfal contacted him to see if he would sell it, Sansweet said. Is Sansweet’s exactly the same, with the copyright notice on the back leg? He said he wasn’t 100% sure. But he was definitely going to check when he got back to the museum. As the convention drew to a close, there were still no serious offers, but Rachfal, who operates out of Roseville, Calif., near Sacramento, said he hoped the attention will attract some offers in the weeks or months ahead. He said sometimes there are “average collectors” who, in the interest of simplifying, occasionally cash in a larger collection for one signature item like this. 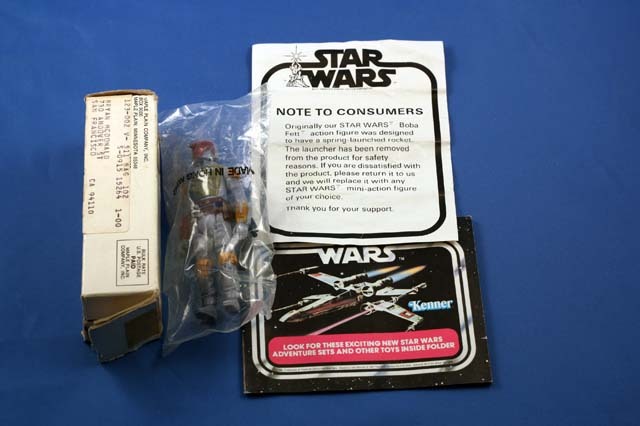 The Rocket Fett he’s selling was in the possession of a Kenner engineer for decades until a collector purchased it in 1994, around the time the Cincinatti-based toy manufacturer was purchased by longtime rival Hasbro. Kenner’s product line was absorbed, and the company shut down in 2000. In 1999, this Rocket Fett was sold to a Japanese collector, and Rachfal was instrumental in acquiring it on behalf of the current U.S.-based anonymous buyer. Now it’s for sale again. Not everyone who buys these does so for nostalgia. Rare Star Wars toys can be as much of an investment as buying a house to flip. In addition to this one, Rachfal advertises a finder’s fee on his website for anyone who might help him locate any other rare Rocket Fetts that are on the loose. The going rate for a successful capture: $10,000. Just make sure it’s in good condition.